The national movement to ensure that workers can take time off when they are sick won another victory this week, as the City Council of Jersey City passed an earned sick time ordinance. When the ordinance is signed by the mayor, Jersey City – New Jersey’s second-largest municipality – will become the sixth US city to have enacted an earned sick days law, joining San Francisco, Washington DC, Seattle, Portland, and New York City. 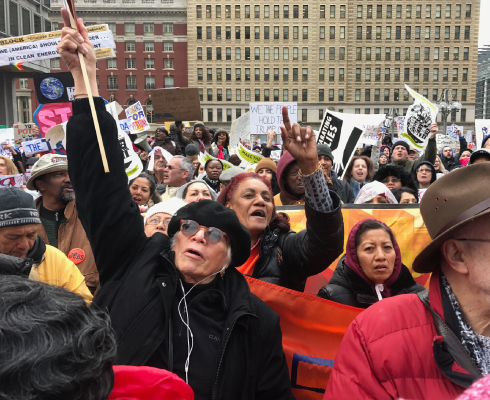 The Center for Popular Democracy (CPD) provided legal support to the coalition that drove the legislative campaign in Jersey City, which was led by SEIU 32BJ, the Working Families Party, and members of the NJ Time to Care Coalition. CPD helped draft the ordinance and negotiate its final wording. Around 30,000 workers in Jersey City currently cannot take time off from work when they are sick. This threatens their well-being and puts others at risk: when people show up to work sick because they can’t afford to take the day off, they spread illness to their co-workers, customers, and fellow commuters. And, when parents have to send their sick children to school, other children get sick, too. The Jersey City ordinance will guarantee workers at firms with more than 10 employees the right to take up to five days of paid time off per year. Workers at smaller firms will have the right to take unpaid time off without fear of losing their jobs. The next target for earned sick days legislation is Newark, the state’s largest city. A super-majority of the City Council has expressed support for legislation there, which will be introduced in the coming weeks.